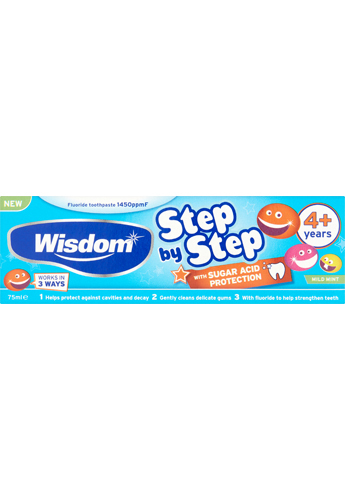 Wisdom Step by Step Cavity and Enamel defence 4+ toothpaste has been developed to work in three ways to clean and protect growing teeth. 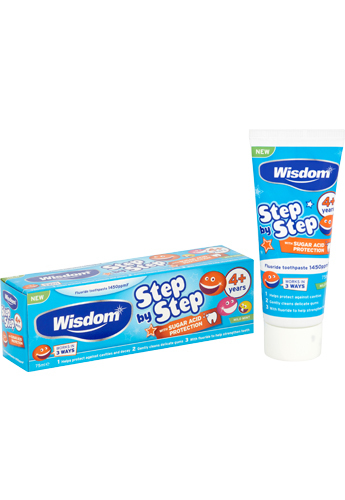 Ingredients: Sorbitol, Aqua, Hydrated Silica, Glycerin, PEG-8, Sodium Lauryl Sulfate, Cellulose Gum, Sodium Monofluorophosphate, Aroma, p-Anisic Acid, Sodium Saccharin, Sodium Hydroxide, CI 19140, CI 42051, CI 42090. Age recommendations have been provided for guidance. Consult your dentist on toothpaste usage.